I've been holding out on you, and I am so sorry. From now through December 13th, you can get 40% off of purchases sitewide at Tarte Cosmeticsand a free signature purple snakeskin card case with a $25 purchase by using promo code FFDEC at checkout, not to mention free shipping on all orders over $40, and, as always, free samples with ANY purchase . The pinch me mini cheek stain set isn't covered in rhinestones but it does feature three of Tarte's most popular cheek stain shades (tipsy-sheer peach with touch of shimmer, flush (sheer berry red and true love-sheer watermelon), tucked into a lacy purple pouch for just $25. 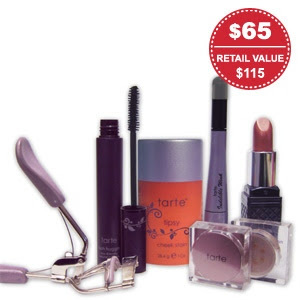 There are plenty of Tarte gift sets to choose from for the holidays. The limited edition holiday gift set is a great introduction to the brand, featuring natural cheek stain in tipsy (sheer peach with a touch of shimmer), mini glistening powder in sugar daddy (bronze shimmer), indelible wink in charcoal, picture perfect eyelash curler (the best I have ever used! 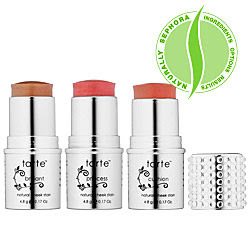 ), lash hugger eco-friendly natural mascara and vitamin infused lipstick in hatha (shimmery rose). Great as a gift or as a way to prepare for the oncoming deluge of holiday parties! 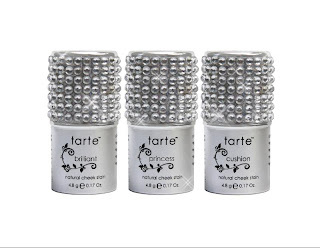 Disclosure: I received the glitzy cheek stain set to review but my opinion is my own and I have purchase Tarte Cosmetics often. 40% is a great deal- and they didn't even ask me to tell you about the sale. Oh that cheek stain is legendary. Good stuff. I'd like to try their stuff sometime. I'm looking paler and paler as the years go by.